To participate in and observe what is happening in New York could serve as a pivotal experience for anyone who is feeling moved by the wave of protests and revolutions moving across the world right now. The bus trip is up to $35 round-trip and it's well worth it. After only a week back in the U.S. from a tour of Europe, I took a second trip up to Wall Street last weekend to participate in the mass global day of action on October 15. I was feeling too inspired by my previous trip and by the knowledge that hundreds of protests were being held that day in Chile, Argentina, Spain, Italy, Greece, Ireland, England, and most places in between. All these protests were globally linked by their shared resistance, but rooted locally in their own respective battles against the forces of an international corporate financial system that has drawn some of its final lines between itself and those who unwillingly make it possible. When I arrived at Liberty Plaza, the site of the massive sleep-in occupation, there were already thousands of people there. It took so long to get through the park because of the sheer density of the crowd that I opted to head early to Times Square. 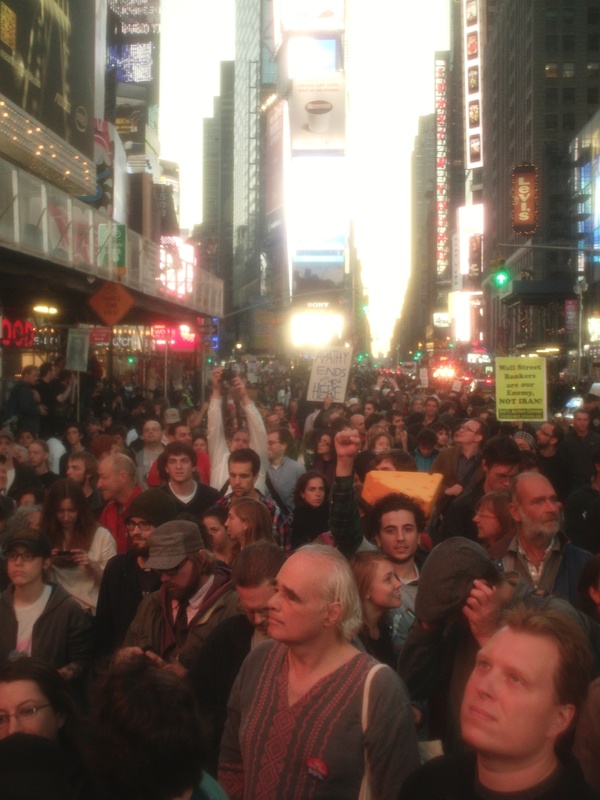 There, at 5:00 pm, was the big event of the night, dubbed “Occupy Times Square”. En route I found out a massive student assembly was beginning to march from Washington Square to the big rally. I caught up with them just as they were stepping off and I ran up and down the crowd a few times to shoot some footage and snap some photos. Folks were packed on the sidewalks, being escorted by thousands of police officers along the whole route. After a few minutes of documentation, I marched alongside many others. At some point, I began to feel something I hadn't felt in a long time, as a bitterness I have worn for years was pushed aside by the spirit of the people. I was re-animated with participatory energy. I was excited, not just to be in the streets again, but to be part of a movement that was erupting with power. There was hope, but not a hope based on illusion or blind faith, a hope based on a commitment to follow through on something that seems to be working, at least for now. I was chanting, clapping my hands, and becoming part of this movement. To feel that energy again was amazing, because that was the energy that pushed me into getting involved in organizing for social change, that led me to write music and write articles like this, that led me to the many organizations I have founded or participated in, and that led me to make or begin making personal changes in my life as part of my own individual struggles against injustices I have done to others or that have been done to me. And looking around to see that others were sharing in that energy gave me more hope, because they will take that experience home with them as I took it home with me a little over a decade ago when I was first stepping into the streets. Mid-way through the march, a man rolled up to an intersection with 100 plastic buckets, each containing a set of drum sticks! He just started handing them out to whomever wanted one, so I grabbed one and many around me did the same. From that point on, energy just grew and grew. There grew a massive beat that sustained until we dispersed hours later. Arriving in Times Square was a massive celebration. The contrast of the immense power displayed by the billboards and lights and our power as a movement of people filled with rebellious joy was surreal. We celebrated because we had won. We said we would march unpermitted with thousands of people to the center of entertainment and corporate consumer symbolism in the financial capitol of the world, and we did. This was the goal. Unlike other actions where the goal might be to shut down an intersection or blockade a business, this one was purely internal. The goal was to recognize, celebrate, and build our power as a movement. And we did all three of those. The internal dynamics of this movement, what it does and means to its participants, is one of its key strengths. It consistently brings people in, and allows space for both agreement and disagreement, challenges and celebration, and a willingness to revise and reassess its own declarations. One of the beautiful things about this internal focus is that rallies and marches don't begin and end with monologues by celebrities, professional activists, or the same small group of leftist speakers who have giving similar speeches for about a decade. Instead, because the city will not allow amplified sound, those demonstrating are forced to turn inward, to look at each other and interact. They make up chants together, give impromptu speeches to small groups, sing songs, or just get to know each other. This “mass” contains many small nuclei, which is why this movement feels so powerful. Its participants are actually empowered by both the thrill and the challenge of holding leadership and being integral parts of the culture of the demonstration. Towards the end of the rally, a young man came through on another person's shoulders and gave a “mic-check”, to which the crowd responded with a massive “mic-check!”. This is a way of making an announcement, a call-and-response method that emerged as result of police not allowing bullhorns or amplified sound. Instead of debilitating the movement, however, this has actually empowered people further, and has created an environment where anyone can address the crowd, and people listen closely. Once the crowd was attentive, he announced that a mass assembly would be held after the rally at Washington Square, back where we started, and that some folks were going to be discussing “taking” that park as well. Though there were a number of arrests during the action, few knew. The crowd stretched so far back from the front, where the arrests took place, that we hadn't much insight as to how significant the situation up front was. What we did know was that the crowd was quite big, up to 10,000 by my estimate. After the march there was a mass arrest right up the street from the square, where over fifty people were said to have been arrested for who knows what. As we attempted to support those arrested, the police pushed us a bit and moved us off of the corners. 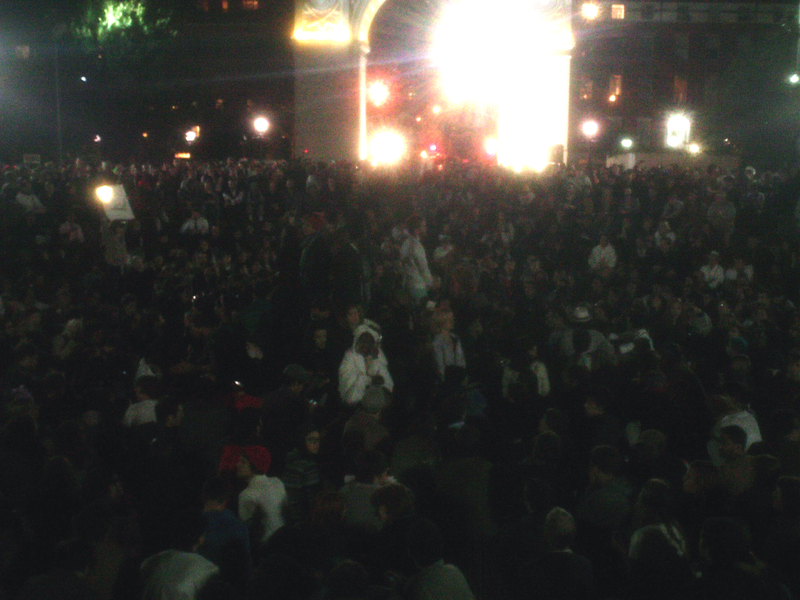 We slowly dispersed after the arrest buses left and re-converged at Washington Square for the mass assembly. I have never seen a meeting as large as the assembly at Washington Square, not in my twelve years of attending meetings and mass protests. It was well over 1,000 people at the height, using full consensus process and an open “stack”, meaning anyone can speak. After 2 hours or so, the crowd agreed to meet in “break-out groups” to discuss the strategic value of taking Washington Square that night. After much discussion in smaller groups, the crowd reconvened as a mass and began again discussing the idea. 1,000 people doing this, participating, observing silence during the meetings, and doing call-and-response echoing of every sentence, is something amazing to witness. And it says something about the immense level of participation and collective-power in this movement. Police began surrounding the park as a ranking officer announced via bullhorn that we would have to leave by midnight or face arrest. It was then about 11:30, and the crowd was still in the process of making a decision. Just before things could have gotten tense, at about 11:50, the crowd came to consensus; it was not of strategic value to take the park tonight, but perhaps it would be in the future. The decision was reached to reconvene the next night and to leave for now. To the disappointment of the hundreds of cops that had taken up positions around the park, we left. Many marched back to Liberty Plaza downtown, others scattered to other places around the city to catch some sleep. When I arrived the next morning to the occupied plaza, there already thousands of people there again, full of energy and discussion, and there were some new features that participants had built. A “think-tank” had started, where people were urged to write down their desired goals for the movement, their political beliefs, and the issues they feel need to be addressed in this country and in the world. Then, the think-tank organizers will categorize them and host discussions on main topics of interest. When I was there, there were twenty or so folks discussing health-care. 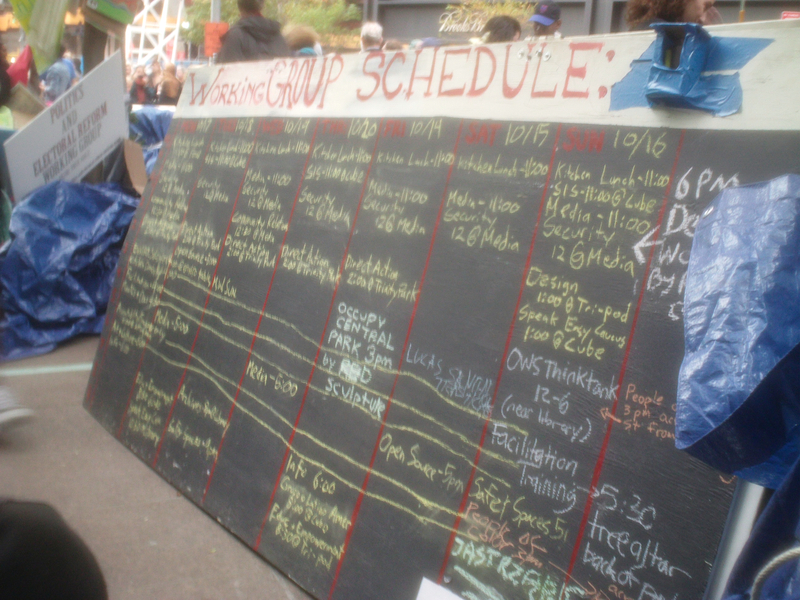 There was a new schedule, giving folks a glimpse at the week to come. Behind that, folks had established a silk-screening assembly-line where anyone could give a shirt or piece of fabric and get their own “I Am The 99 Percent” images. Up on the steps, there was an amazing hip-hop poetry session going on, led by a team of radical hip-hop artists from the Bronx and Brooklyn. Many of those performing had been in the mass assemblies, had helped clean the park, and had been participating in the occupation. There is so much more to be said of what is happening in New York, but one must see it to really understand it. So, as I said in the beginning, go to New York!! Even if you are doing work locally or participating in your own town's “occupation”, go. It will be a good learning experience that you can bring home with you, and it will inspire you with the culture of possibilities that has emerged over the last month there. And bring your friends, relatives, and co-workers. If you can’t go yourself, help a friend go and make sure they give a good report-back when they return.... Because it will help spread the spirit of this movement where it needs to go, to small locales around the country and around the world.